Title: The Nakimu Caves, Glacier Dominion Park, B. C.
Glacier Dominion Park, B. C.
On the road to the Caves—Ross Peak in centre. Near the summit of the Selkirk range of mountains in British Columbia is one of the most curious series of subterranean caves in the world. Being of recent discovery and, up to the present, almost inaccessible except to the most agile and daring they remain practically unknown to the world at large, but to those bold spirits who have dared their black depths they have offered an experience, weird, thrilling and wonderful. Less than a thousand visitors at present make the journey to the Caves each year. To the graphic description of Arthur O. Wheeler, president and founder of the Canadian Alpine Club, together with the report of W. S. Ayres, the mining engineer who was commissioned by this department to report on the Caves, the substance of this pamphlet is indebted. The Dominion Government is at present having work done which will render accessible to the public this unusual and somewhat gruesome curiosity. A good road is already built between the little alplike town of Glacier to within 6,000 feet of the Caves and a trail connects this point with the entrance. The distance is about seven miles by saddle pony from the beautiful Canadian Pacific Railway hotel at Glacier to the end of the road, and the whole journey can be finished on foot in five hours. The ride is through scenes almost incomparable, perhaps even in the Rocky or Selkirk mountains. “The valley of Cougar creek is divided into two parts of distinctly different characteristics. The upper valley, a great spoon-shaped basin extending from Lookout point to Cougar pass, is a most pronounced form of the type known as ‘hanging valley,’ or one that has been carved out in a U-shaped cross section by the eroding power of a glacier at one time filling up its bottom. This glacier has now shrunk to very small proportions at the extreme head of the valley. The floor is on a comparatively low grade and, at one point, is covered for about half a mile by a small lake-bed in which some water lies during the summer. The entire length of the upper valley may be put at 2½ miles. It is inclosed by the rocky steeps of Mount Bagheera, Catamount peak and Mount Ursus Major, on the north, and of Cougar mountain on the south. On the sides of these massives are small glaciers, busy at work tearing down the entire structures. 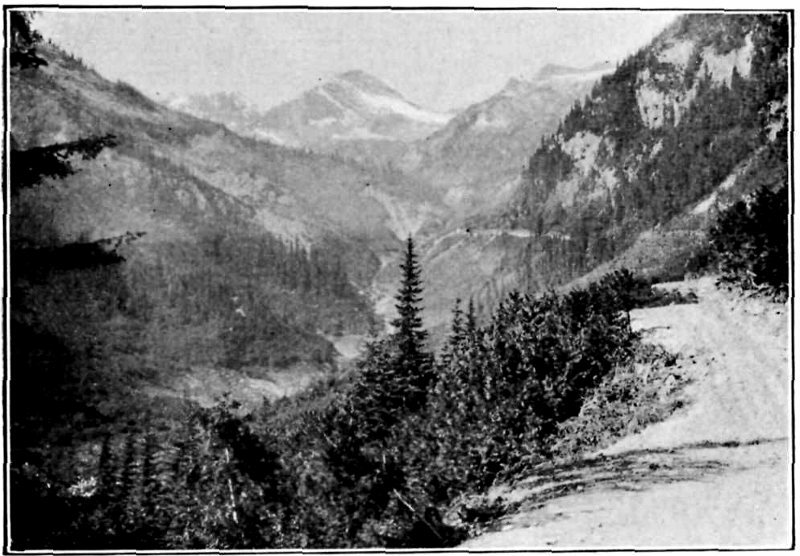 At the head of the valley, Cougar pass leads across the shrunken glacier to a steep ravine descending to the railway at some distance below Ross Peak station. 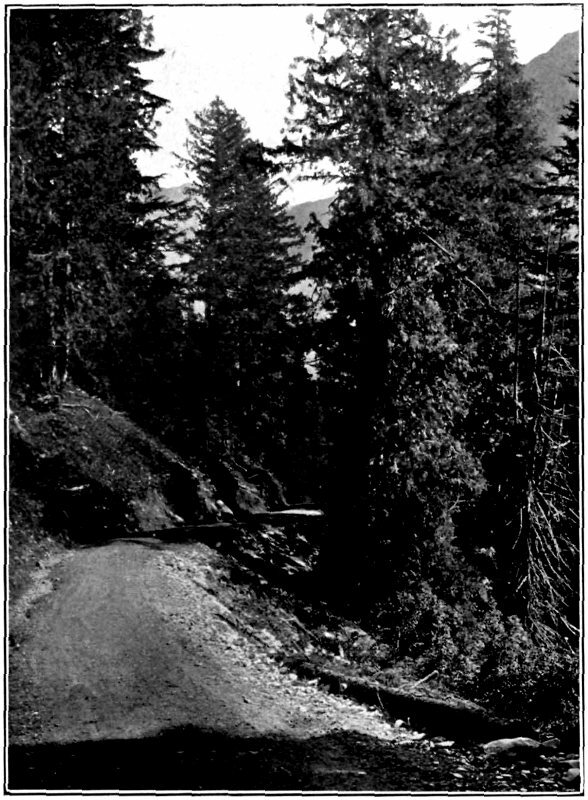 On the road to the Caves—Showing Cougar Valley; Mts. Ursus Major and Bagheera in distance. “It would be difficult to find a more beautiful example of the alpine valley. In every direction silver water-falls leap down the sides from the glaciers and melting snows of the surrounding peaks. These collect at the bottom of the valley in one central stream which bounds in foaming cascades to the little lake-bed mentioned above. It leaves this, and, continually augmented by falls from above, rushes through luxurious meadow-lands in a second series of cascades that have worn down to bedrock, showing where a thin veneer of soil is overlaying it. The alpine meadows and park-lands, as well as the open mountain slopes of the valley, are throughout the spring and summer decked with a gorgeous array of flowers of varied hues which, in places, are so profuse and brilliant that it seems as though nature had spread a carpet of rainbow colours for the delight and wonder of her visitors. In early spring, the giant Adder’s Tongue (Erythronium gigantium) covers whole acres with a brilliant yellow. These flowers are the first, and may be seen pushing their heads up through the snow. Like all spring flowers in this region, they follow the melting snows, and may be found higher up in the valley as late as August. 6 Almost coincident with them is the Globe flower (Trollius laxus), a plant of much beauty and great wealth of blossom. Next come the scarlet and crimson Painter’s Brush (Castilleia), showing everywhere in the open and on the lower slopes with a blaze of glory. Later still, the blue Larkspur (Delphinium bicolor) and purple and pink Asters replace the earlier series, the crimson and yellow Monkey-flower (Mimulus) are found in the beds of the streams and where moisture is prevalent; high up in the valley and on the alp-lands below the rocks are seen the False Heaths (Bryanthus and Cassiope) and, highest of all, the pink-flowering moss (Silene acaulis), found in magnificently flowered bunches directly below the ice. There are very many other species more rare, and just as beautiful in blossom, but of not so frequent or noticeable occurrence. “The timber consists, in this upper valley, chiefly of spruce and balsam, trees which, at this elevation, in the Selkirks attain a grace and beauty that is not noticed in the more crowded areas of lower altitudes. Here they rise symmetrically to a great height, and their sweeping lower boughs form shaded canopies that are most inviting during the sultry summer weather. 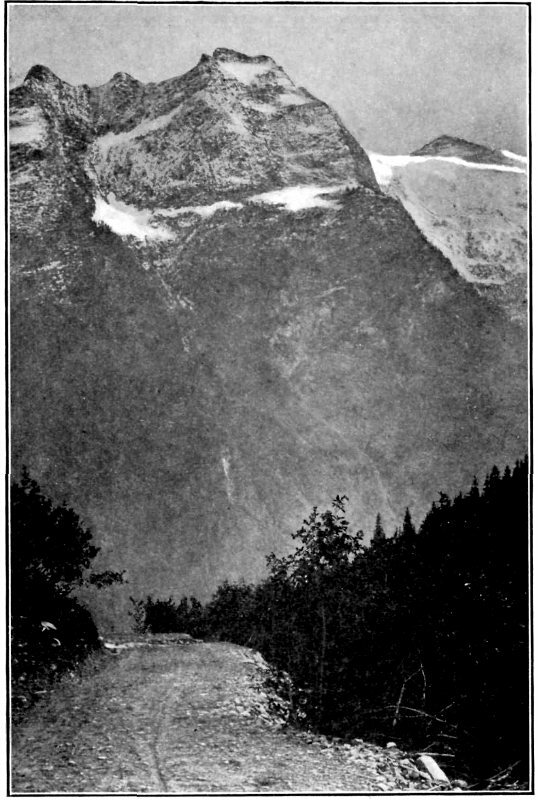 “As the head of the valley is approached, a short climb will convey the explorer to the ice of several small glaciers where he may study with ease their formation and action, look into miniature crevasses and see how moraines of rock detritus are formed by the downward flow of the ice. “At the site of the Caves, Cougar Creek valley turns from a northeasterly to a southeasterly direction, and falls sharply 2,000 feet from Lookout point to the tank, as compared with 1,200 feet for the upper valley in the same distance, about two miles. The lower valley is V-shaped and has, for the most part, been carved out by the action of water erosion. The sides except immediately adjacent to the railway are timbered only in patches and are for the most part covered by closely growing alders, bracken and rank grass which have replaced the timber where the slopes have been swept clear by avalanches from the heights above. Through the latter half of this section of the valley the stream flows in a narrow canyon and the fall is steep. As soon as the corner is turned and the slopes of the Illecillewaet valley reached, a magnificent forest growth of Douglas fir (Pseudotsuga Douglasii), hemlock (Tsuga Mertensiana), cedar (Thuga gigantea), and a few scattered trees of white pine (Pinus strobus) is passed through. Goat Falls—Near the entrance to the Caves. “From a natural history point of view, the upper valley is exceptional, due largely to the absence of visitors in the past. The Rocky Mountain goat (Haplocerus montanus) may be seen frequently, and his tracks are everywhere along the heights. During one of our visits a grizzly bear (Ursus ferox) was killed by Deutschman. The black bear (Ursus americana) is plentiful at the head of bear creek across Baloo pass, and it may be safely assumed that he does not fail to visit Cougar valley. Of the smaller mammals, the hoary marmot or whistler (Arctomys Columbianus) is plentiful in both the upper and lower valley, and is here found in large numbers, larger in size and giving forth a louder and more shrill whistle than in the main range of the Rockies. Its startling note is very human and resembles much the noise that delights the heart of the small boy, produced 8 by placing the fingers between the lips. Say’s squirrel (Spermophilus lateralis) and Parry’s marmot (Spermophilus Parryi) are also found, the latter in great numbers. The Little Chief hare (Logomys princeps) is frequently seen disporting itself among the rocks, and its comical antics and quaint squeak, resembling that of a toy rabbit, are very amusing. “The birds are few, and in the upper valley are chiefly confined to the Ptarmigan (Lagopus leucurus), of which a flock may nearly always be seen, the water ousel or dipper (Cinclus Mexicanus), a funny little dark grey chap who flits from stone to stone along the cascades and falls of the valley, continually bobbing and dipping as though it were the object and aim of his existence. This bird has a very sweet note. Of other birds the black-headed jay (Cyanocitta stelleri annectens) and the Rocky Mountain Whisky Jack (Perisoreus Canadensis capitalis) are the most apparent. 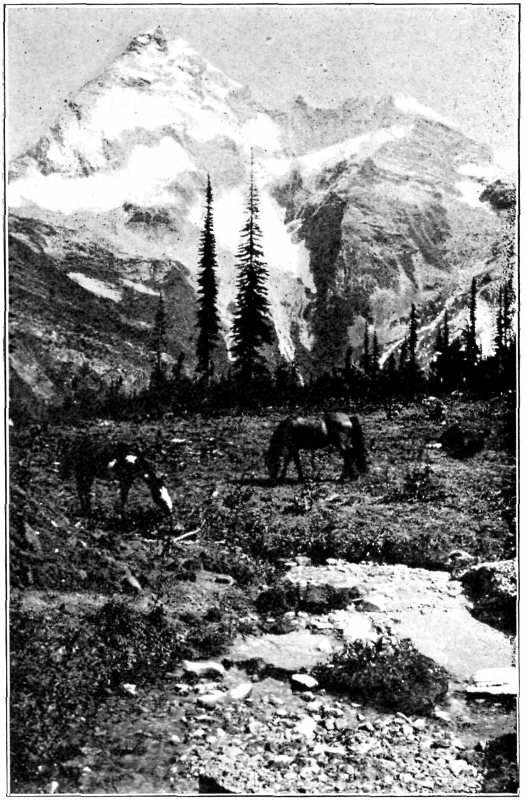 It was in the year 1904 that Charles Henry Deutschman of Revelstoke, a British subject, while prospecting and hunting big game, discovered the Caves in series. 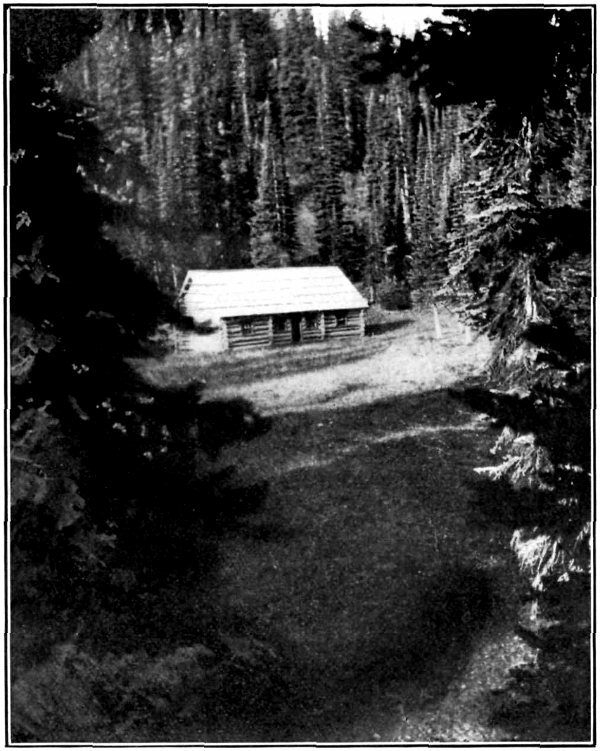 The next person to enter the Caves after Deutschman was A. Johnston, editor of the Revelstoke Mail-Herald. Next, in May, 1905, a party of twelve persons, including W. S. Ayres, the mining engineer, Howard Douglas, superintendent of Rocky Mountains Park, and R. B. Bennett, the Associated Press correspondent at Vancouver and now member of the Dominion House representing Calgary, visited the Caves. Most of this party, however, returned to Glacier on the following day and left Messrs. Ayres, Deutschman, Johnston, Benson and Field to make further explorations. On the road to the Caves—Mt. Avalanche, Eagle Peak, Mt. Sir Donald. Mr. Ayres’ Description of this Exploration. “On the morning of May 30, the entire party entered the cave by the opening which I have designated on the map as ‘Entrance No. 1.’ Pools of water more or less filled with ice were encountered, which greatly impeded our progress, and finally a very deep one, at a distance of 237 feet from the surface, barred further progress until a raft could be prepared. Retracing our steps to the surface we sought an entrance in ‘The Canyon’ by means of a rope. This passage was about 70 feet below the natural surface and about 100 feet above the bottom of ‘The Canyon,’ was very small and blocked with ice. I have designated this opening as ‘Entrance No. 2,’ on the map. “Another opening was found which is recorded as ‘Entrance No. 3.’ Here, by crawling through a very narrow passage on hands and knees and then descending a steep narrow water groove for about 50 feet the brink of a very large cavern was reached that was estimated to be 256 feet deep, but its length and breadth were, owing to their great extent and to the insufficiency of lights at hand, inaccessible. It was observable, however, that several openings led off from this great cavern. The plunge and roar of a great waterfall somewhere down in the depths of this cavern reverberates in every inch of space, and produces in the listener sensations so weird that even those that have elsewhere met its counterpart are at first startled. “No further attempt was made at this time to explore the cave through this entrance for the reason that the three hundred feet of rope sent by Mr. Ford, resident engineer of the C.P.R., for our use, had not yet been brought up to the cave from the water tank. On the following day another obstacle presented itself. 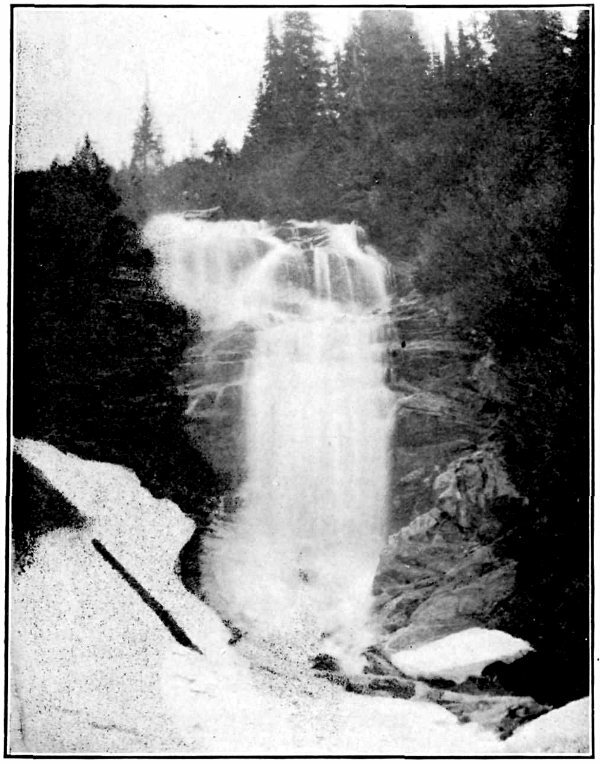 The rapidly melting snow formed a sudden rush of water which poured down the mountain side and into this opening, and made it not only inaccessible for the time being, but proved it to be positively dangerous to enter for any extended explorations until the snow has practically disappeared. “At a point in the main entrance just as we emerge from ‘The Auditorium,’ a branch passage was found which again joins the main entrance about 100 feet from the surface. This 11 branch passage is marked on the map as A-B. Another branch passage was found to connect this entrance with the surface and it is designated on the map as B-C. A diligent search in this part of the cave disclosed no other accessible openings. “A descent by ropes to the bottom of the canyon at ‘Entrance No. 2’ was considered but it was deemed entirely unsafe, owing to the very large accumulated mass of snow which might slide into it at any moment, and without warning. Besides this, no entry can be made until Cougar creek has subsided to a mere brook. Mr. Wheeler’s Exploration and Description of the Caves. “Up to this time, only the Gopher Bridge series and the Mill Bridge series (see map) had been explored. It was not until a day or two before the close of the survey, August 4, that an attempt was made to penetrate the huge opening seen at the north end of the bottom of the gorge. On the date named, the writer descended by means of a knotted rope, and was followed by Deutschman. The stream was then at high water, and pouring into the opening with a tremendous rush and swirl of waters. Although the creek was crossed by wading waist deep in the icy torrent, it was found impossible to penetrate more than a couple of hundred feet into the depth. Later in the month Deutschman, alone and unaided, penetrated this opening and worked his way across the stream, discovering what is now referred to as the Gorge series, or the series of passageways reached by the opening from the Gorge. And here the writer begs to say a word or two concerning this remarkable man. The work of exploration he has done without assistance, shows a character utterly devoid of fear. The descent into depths of blackest darkness, lighted only by the dim rays of a tallow dip, without a rope or other aid except in a case of direst necessity, requires more than courage; it requires strength of purpose and 12 power of will far beyond the ordinary degree. For, added to the thick darkness, there was always the fierce vibrating roar of subterranean torrents, a sound most nerve shaking in a position sufficiently uncanny and demoralizing without it. Huge cracks had to be crossed, and precipitous descents made in pitch darkness, where, it is safe to say, a misstep would have instant death, either suddenly or through disablement. Now that ladders are placed and ropes set, and the sure path pointed out by this intrepid guide, it is difficult to realize how in the first place the passage could possibly have been made without. Typical Alpland—On Mt. Abbott about 1 mile south of Glacier. “On leaving the lake-bed above mentioned, Cougar creek flows in a series of cascades for a little more than half a mile through open alpine meadowland, broken here and there by knolls crowned with scrubby spruce. Suddenly, without warning, it drops into a cavity and, 450 feet farther down, quietly issues from its underground way. During this disappearance the stream has only dropped 30 feet. The intervening space between the entry into and exit from the ground has been named ‘Gopher Bridge’ by the first party visiting the Caves, owing to the large numbers of Parry’s marmot, which much resembles a gopher, to be seen in the immediate vicinity, and the underlying passages are here referred to as the Gopher Bridge series. 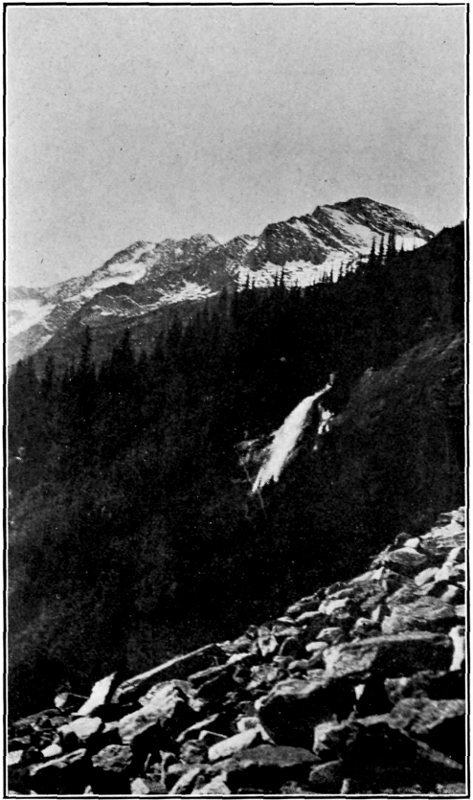 Directly opposite the disappearance of the creek, two striking cascades tumble down the mountain side and uniting, flow for a short space parallel to Cougar creek; then, vanishing into a hole in the ground, they join the main stream by a subterranean passage. 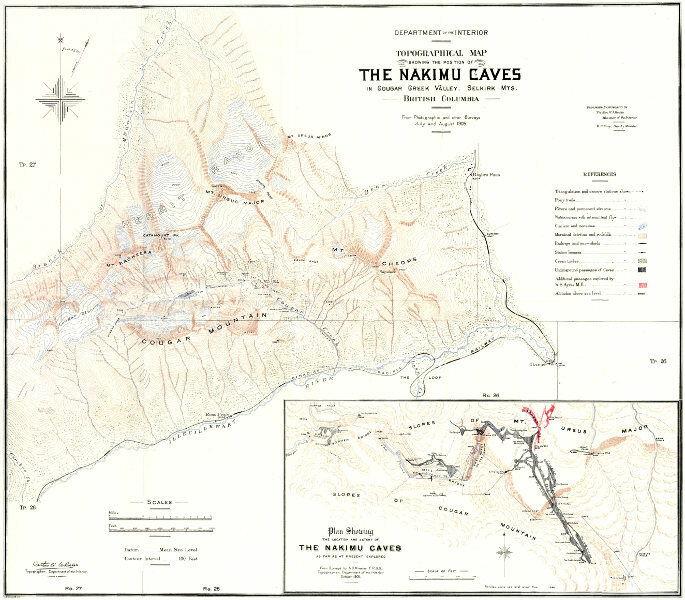 They are known as ‘Gopher Falls,’ and the place where they disappear as the ‘Gopher Hole’ (see map of Caves). “The Gopher Bridge series of passageways was at first entered by the opening shown on the map as ‘Old Entrance.’ It was a very disagreeable operation, entailing much wriggling and squeezing through narrow cracks over dirty rocks. Eventually, a point of vantage was reached directly over the subterranean torrent. At the time of the first exploration the writer took acetylene bicycle lamps, whose bull’s-eyes enabled the pitch darkness to be pierced to some extent. Magnesium wire also was lighted, and, by its aid, for a brief minute, the interior was bathed in dazzling brightness. Standing on a narrow ledge that overhangs a black abyss, the eye is first drawn by a subterranean waterfall heard roaring immediately on the left. It appears to pour from a dark opening above it. Below, between black walls of rock, may be seen the foam-flecked torrent hurtling down the incline until lost in sense shadows. Overhead, fantastic spurs and shapes reach out into the blackness and the entire surroundings are so weird and uncanny that it is easy to imagine Dante seated upon one of these spurs deriving impressions for his inferno. As the brilliant light goes out the thick darkness makes itself felt, and instinctively you feel to 14 see if Charon is not standing beside you. This subterranean stream, with its unearthly surroundings, is somewhat suggestive of the Styx, and incidentally supplied the name ‘Avernus’ for the cavern of the waterfall. “At one time the stream entered by this opening, but a natural dam has gradually been formed causing it to find a new opening at the spot where it is now shown disappearing on the map. About midway between the entrance of the creek and the old entrance, Deutschman has excavated a small natural opening to a size sufficiently large enough to admit an average person with comfort. A small passage joins with the underground way of the creek, and by following along its edge you eventually come to the point of vantage previously described. En route, several small chambers are passed, originally carved out of the rock in the form of potholes by the swirl and swish of the waters, but since much distorted in shape owing to disintegration of the cleavage planes. The spot is unique and wonderful, and the sensations it produces eerie in the extreme. It is well worthy of a visit. On the road 2 miles from Glacier—Ross Peak in distance. “On making its exit at the eastern end of Gopher Bridge, Cougar creek pours down a narrow rock-cut for a distance of 350 feet, when it again disappears in a whirl of flying spray below the surface of the valley. It reappears, 300 feet farther on at the bottom of a deep gorge, having dropped 85 feet while underground. The interval between the exit and entrance has been named Mill bridge by the party previously mentioned, on account of the roar of the water as it rushes underground through the choked entrance, resembling the noise made by a big mill in full operation. “The rock-cut above referred to is narrow, about 8 to 10 feet wide, and of regular appearance. The upper half presents a series of cascades and falls, and the sides show curious small potholes that are in the process of erosion from the soft limestone. It has been named ‘The Flume,’ owing to its resemblance to a millrace. There are several openings at the point where the creek disappears, and its last spectacular leap as it vanishes underground is very striking. 70 feet farther east is a larger opening, at one time the point where the stream disappeared, but as the rush of water cut deeper in the rock channel it took advantage of a handy crack and gradually carved out for itself the opening where the full volume now descends. “About the centre of the flume, on the eastern side, and 30 feet from it, is the entrance to the Mill Bridge series of the caves, shown on the map as ‘Entrance No. 1.’ This entrance is a mere cleft in the rock strata, and is only wide enough to admit of the passage of a man’s body. The total length of the underground passageway, at one time accommodating a very considerable volume of water, is 400 feet. The height varies from a minimum of 10 feet to a maximum of 25 feet, and the width from 3 to 15 feet. At its eastern end it opens to an irregularly-shaped chamber of approximately 60 by 70 feet, with a greatest height of 20 feet. This chamber has been named ‘The Auditorium’ by the first exploring party. Cougar creek in its flow beneath Mill bridge passes through the Auditorium, and as it falls 75 feet in a distance of 200 feet, from its entrance beneath Mill bridge to the Auditorium, the chamber is replete with its roar, and the name is appropriate, though hardly in the conventional sense of the word. Faint daylight enters through the passageway of the waters and serves to make the surroundings look dim and mysterious. The frosts of winter also reach this spot, and in the spring stalactites and stalagmites, formed of huge icicles, are seen in columnar groups surrounding the dashing waters and extending some distance into the chamber itself. In this particular spot disintegration has created much havoc and the walls no longer show the marks of water erosion, while the floor is heaped with rock debris fallen from the ceiling. The passageway, however, that connects it with the surface is still intact as a sample of the power of water erosion. It is composed 16 of a series of potholes, connected one with the other by short narrow passages. The bottom of each succeeding pothole, as you recede from the entrance, is at a lower elevation, sometimes as much as ten or fifteen feet. To make access possible, Deutschman has, with the assistance of a bridge carpenter loaned by T. Kilpatrick, superintendent of the Canadian Pacific Railway Company at Revelstoke, placed rough ladders from floor to floor. Most of these potholes hold water in the hollows at the bottom, and, in one case, the water is so deep—4 or 5 feet—and the potholes so wide that a floating bridge had to be built. When it is realized that every bit of timber used in these constructions had to be hewn from the tree and transported on the shoulder or back, over a road hardly accessible for a mountain goat, to the place where it was utilized, some idea of the magnitude of the work can be formed. “At one spot the passageway twists in a loop, and here the potholes are of such a curiously spiral form that it has been named ‘The Corkscrew.’ Across this bend, about 12 feet above the main floor, a gallery extends for 120 feet. It is of a similar pothole formation, but on a smaller scale than the main passageway. Directly below it, at the lower end, is a peculiar sharp spike of rock that has evidently been subsequently carved out by water pouring from this gallery, as is readily shown by the erosionmarks on the component rocks. In addition to the lines of erosion on the rock spike and in the gallery pothole, honey-combing is seen on the right and high up on the left and, still farther on the left, spatulated markings to the depth of half an inch, or a little over, which is a very common feature in all three series. “Throughout the Mill Bridge series, with the exception of the Auditorium, the floors and ceilings are of water-worn rock, and practically no debris has fallen away pointing to the fact that this channel is of more recent origin, and the rock through which it has worn of a more compact stratification. “At one time it was reported that the roof of this passage was set with sparkling quartz crystals. It turned out, however, that they were only drops of water that had collected through leakage or condensation. Some of the potholes are very curiously marked by thin incrustations of carbonate of lime spreading over their concave surfaces in florescent patterns. Overhead in many places are seen projecting spurs that have withstood the action of the water owing to superior hardness, or that, through some deflection of the current, have not had the same force brought to bear upon them. The waters of Cougar creek are derived from the melting glaciers and snow deposits lining the sides of the peaks enclosing the valley and, in consequence, carry a considerable quantity of sediment, composed of very fine rock particles. The quantity of sediment carried would, of course, be greatest when the stream was at flood stage. This sediment has doubtless been a factor of much importance in the erosive power of the waters, and a residue may to-day be seen 17 as a very thin mud-coloured coating on the walls and floors of the passageways, where it has been deposited by the subsiding waters. At a very high stage of water in the creek there was an overflow into Entrance No. 1 that made the first exploration by W. S. Ayres and party a wet and somewhat dangerous operation. This overflow, however, was dammed back by Deutschman, and no further trouble has since been experienced with it. “As stated above, the exit of Cougar creek from Mill bridge takes place at the bottom of a narrow crack, or gorge, running at right angles to the general direction of the stream. The Gorge is 300 feet in length, about 50 feet wide, and is spanned by two natural rock bridges. The sides are composed of badly shattered limestone. On emerging from its subterranean course beneath Mill bridge, the creek flows through the Gorge 80 feet below the floor of the valley. At the lower or north end is the opening that leads to the largest and most interesting of the series of passageways forming the Nakimu Caves. The Gorge forms a very striking feature of the external scenery, and several places are accessible from which views may be had into its depths that are wild and impressive in the extreme. The opening is a dome-shaped break in the wall forming the north end. Into this the stream tumbles with wild fury over a confusion of huge fragments of rock piled up in the passageway. It creates leaps and falls and a dissemination of spray that makes the opening to the outer world, as seen from below, appear through a luminous mist. The aperture is some thirty feet wide and about the same height. View from Road—Mt. Avalanche, Eagle Peak, Mt. Sir Donald. “Proceeding downwards, at the foot of the falls, the channel resumes its normal direction of a little south of east. It is necessary here to cross the stream, which swings northward into lower depths, and from now on the passageways are quite free from wet, though somewhat damp from the moistness of the Atmosphere. At the turn of the Creek’s direction you enter a chamber 150 feet long, 25 feet wide and from 10 feet high at the upper end to 30 feet at the lower end. This chamber is dimly illuminated by the daylight from outside. It is in a bad state of ruin, and the floor is heaped with debris thrown from the ceiling and sides. The roof is composed of one immense slab of rock sloping with the dip of the strata. The creek has broken through the northeast wall nearly in the middle of the chamber and disappears into the blackness with a dull reverberating roar. Fifty feet beyond the creek, the passage turns north again and it is necessary to descend a rock face of some 12 feet. On it are natural notches or footholds that would seem as though they had been cut with a cold-chisel for the special purpose; for persons unaccustomed to climbing, it is well to use a rope to steady the descent at this spot. The creek is now heard far down, welling through some rock-cut with a dull, intermittent pounding, resembling the blows of an immense sledge-hammer. Forty feet to the right, through a low roofed passage about 2 feet high, you creep into the ‘Dropping Cave.’ It is about 30 by 40 feet and 6 to 10 feet high, and so named from the fact that water drops from the roof in all directions. The floor is composed of broken rock fragments, and the walls and ceilings of dark blue limestone marked in places by irregular streaks of white crystalline calcite. At the eastern end, a very narrow passage between fallen masses of rock, affording barely room to squeeze through, leads to ‘The Witches Ball-room.’ It is 1½ to 2 feet wide, 3 to 4 feet high and some 20 feet in length. “The Ball-room is roughly triangular in shape with sides of about 60 feet, and an estimated height of 50 feet. The largest portion of the space is occupied by an enormous rock that has fallen from the roof. This rock has a generally level surface, and is just the spot where a group of witch-hags might be expected to caper round the ghastly fumes of some hellish cauldron at a Sabbath meeting; hence the name, in sympathy with the ill-omened and weird surroundings. On all sides, except that of the passage, are deep cracks partly choked up by fallen blocks but still exposing many deep and pitch-black holes leading to the unknown, where the underground stream is heard roaring dully. By one of these, at the northeast corner of the chamber, W. S. Ayres and C. H. Deutschman penetrated to ‘The Terror’ and ‘The Old Mill,’ the former 60 odd feet below the Ball-room. Their explorations in this quarter are shown on the accompanying map, in red, and a description of them will be found in Mr. Ayres’ supplementary report. Many of the fallen blocks show crystalline calcite markings similar to those found in the Dropping Cave. “It is now necessary to return to the surface and seek ingress to the caves by means of Entrance No. 3, not far from the Gorge on the eastern side. Entrance No. 3 is close by Lookout point and is the first accessible opening seen on the journey up the valley. A descent is made some 10 or 12 feet by a rough ladder, placed by Deutschman, to a small cavern where there is just room for three persons to crouch. Off this, a very narrow slit, through which it is barely possible to squeeze, opens to a narrow chute. Down this chute, by means of a rope placed around the body, a descent can be made some 20 feet, to the brink of space. From the final ledge a stone will drop a long way before it strikes. The total distance from the opening to the brink of the Pit is 60 feet. “When surveying the Gorge series, the writer discovered a very peculiar passage, shown on the map as the ‘Marbleway.’ It was of a perfectly eroded structure, composed of a number of small connected potholes in a dark bluish-grey limestone, shot in every direction by ribbon streaks of white crystalline calcite. The walls were dripping with moisture and rendered the limestone dead black and the veins of calcite vivid white, the whole resembling a rich glistening marble. This passage was followed to the larger one shown on the map, and that in turn to the circular chamber named ‘The Pit.’ It seemed probable that this was the spot where stones, dropped from the ledge attained by Entrance No. 3, first struck, so Deutschman was sent to reconnoitre and, not long afterwards, his face could be seen near the extreme apex of the roof peering down through the dim halo of his tallow dip. A stone tied to a cord and subsequently measured showed the drop to the floor of the Pit to be 120 feet. “The chamber is about 20 feet in diameter and rises like a gigantic funnel to something over the height named. The walls are similar to those of the Marbleway, and some of the effects are very peculiar, reminding the beholder of forked lightning on a dead black background. At the bottom of the Pit was seen a very queer slab of rock, shaped almost perfectly like a monumental tombstone, and having directly in its centre, as though 20 carved by hand, a cross (+). The descent from the floor of the Pit to the main passage, although slightly precipitous in one or two places, is quite easy, the distance being 120 and 130 feet by the main way and Marbleway, respectively. The walls of the Pit funnel are water-worn and, at one time, a stream flowed into it by Entrance No. 3, doubtless being the cause of the formation of the chamber. The stream, which now only carries off the surplus flow from the melting snows, has found another subterranean opening and joins Cougar creek in its underground way, somewhere beyond the Ball-room. “Similar decorations are found throughout the Caves, though not so extensively as at this and a few other places. At some, there is only a thin veneer of the carbonate formation and, at others, rock-milk (agaric mineral) is seen on the floors and boulders. The writer did not observe any stalagmites, nor any 21 stalactites worth speaking of. The longest did not exceed 15 inches, and resembled, more than anything else, a thin icicle of that length; its chief interest being that it was clear and transparent, as though made of ice, and as brittle as glass. “The Subway is about 10 to 15 feet wide and from 7 to 2 feet high; the roof is arched and covered by moisture drops, which are very unpleasant when they find their way down your back. The floor is of broken rock, rising to a ridge along the centre of the passageway. “From the meeting of the ways, just beyond the Art Gallery, the passage continues southeasterly, ever increasing in interest. In the next 200 feet, it varies in width from 15 to 30 feet with a height of 10 to 15 feet. On the right is a narrow twisting side-opening named ‘The Gimlet.’ On the left are two concave sections of old potholes, leading into the most subterranean depths. They are profusely decorated by florescent carbonate incrustations, the first one being named ‘The Dome’ from its perfect formation. Minor passageways lead from them at a still greater depth. The most southerly one connects with ‘Judgment Hall,’ to be described further on (see map). In this section the underground course of Cougar creek crosses the corridor, at a considerable depth below, and the roar of the hidden waters is transferred from the left to the right hand. “A narrow opening, 1½ feet wide and 15 feet long, now leads to ‘Carbonate Grotto’ where are seen very fine calcium decorations. The Cavern containing the grotto is about 60 by 30 feet, with a height varying from 10 to 15 feet. For the next 130 feet the passage varies from 8 feet wide and 5 feet high at the upper end to 20 feet wide and 5 feet high at the lower end. The sides are hung with rock shelves, and spotted with lime incrustations; the bottom is much impeded by fallen blocks. You now find yourself in a cul-de-sac and apparently at the end of the series. Not so, however, for by squeezing through a narrow opening on the right, barely noticeable in the darkness, you are enabled to descend to probably the largest cavern of all, at a depth of 57 feet below the corridor just left. The chamber, 200 feet long, 20 feet wide and 40 to 50 feet high has been named ‘Judgment Hall,’ on account of a pillar which might stand for the pillar of justice. The floor is littered by blocks broken from the roof and sides which lie piled in great heaps at the north end. The roof is roughly arched, and the sides rise upwards in parallel ledges resembling shelves. Roof, sides, and the rocks piled on the floor, are covered by the white calcite and, in many places, present most beautiful patterns and beds of florescent formations. The north end is connected by a rough passage with one of the potholes referred to below the meeting of the ways. “Near the centre of the western wall, a narrow gap leads to a very beautiful, though small, chamber named ‘The White Grotto’ by W. S. Ayres. The carbonate decorations here are of great beauty and delicacy. The passage in which the chamber is found is 40 feet long, 15 feet wide and 10 feet high. The final 22 cave has been named the ‘Bridal Chamber’ by W. S. Ayres, owing to the purity of its lime draperies and the general beauty of its floral decorations. It is small, and beyond this point exploration has not yet been carried. The passage breaks off in a precipice falling to a deep chasm, at the bottom of which a subterranean stream, probably Cougar creek, may be heard. “This is the farthest point to which the present survey has been carried. It is 240 feet from the Wind crack, previously referred to as being seen on the way up the valley, and is only 54 feet above it; it is safe to assume that there is a connection between. The wind issuing from the crack is probably due to a water blast caused by the subterranean stream falling into the chasm at the end of the exploration. “There are two other passages, or rather sets of passages, that have not yet been mentioned, viz. : ‘The Ice Cave,’ situated above the deep entrance from the Gorge. It is reached from the valley floor and is not of large dimensions, presenting only one chamber of any size, which has been christened ‘The Temple.’ The series has been named the Ice Cave from the fact that the initial passage entrance is blocked by ice all the year round, and an entry is effected over this blockage. “The second set of passages are entered immediately below the Goat falls, which pour into them until late in October, when they become ice-bound. Last October, the writer followed two of the passages—one for about 150 feet, the other for about 50 feet—but could get no farther without material for bridging. The formation resembles the passage leading to the Auditorium, but on a smaller scale, viz., a series of well formed potholes connected one with the other. It is assumed that the flow from the Goat falls, the big bulk of which passes through these two channels, empties into the main waterway at the Turbine, but its course may possibly be more direct. If it does not, however, it is difficult to know where the water flowing in at the Turbine comes from. “It is still something more than half a mile from the end of the present exploration to the final point at which the subterranean waters of Cougar creek are returned to the surface bed. There may consequently be accessible passageways that are yet undiscovered but, as the surface grade over this unknown interior is much steeper and the subterranean creek bed is approaching the surface, it seems probable that, if existing, they will be found inaccessible. “The rocks in which the Cave occurs are of very hard crystalline limestone, dipping about 30 degrees to the east. In ‘Entrance No. 1’ these beds are very thick and are made up of alternate bands of white, mottled and grey marble. Some of the bands are very highly impregnated with fine sharp sand, so much so, in fact, that excellent whetstones can be made from them. On the road 3½ miles from Glacier. White Pine may be observed along the route—a very unusual spectacle in the Selkirk range of mountains. “The Cave has, undoubtedly, been formed entirely by water erosion. The stream which formed it, Cougar creek, is entirely made up of glacier and snow water, and above the cave is free from any lime salts. Its capacity, therefore, to dissolve lime rock when brought in contact with it, is at its maximum. The fine grains of sharp sand, loosened from the lime rock and caught in the swift current of the small stream that at first found its way through a shrinkage crack of some particular bed of limestone, have undoubtedly given the water an uncommon erosive power, which, through the countless years of the cave’s history, has enabled that mountain torrent to carve out a mammoth channel in solid marble. This might imply that in some distant past a seismic disturbance in the interior of the mountain resulted in its Indian appellation, or, on the other hand, it may be due solely to the rumbling sound of the subterranean torrent. Mr. Wheeler, in differing from Mr. Ayres as to the factors mainly instrumental in forming the underground channels and caverns as seen to-day, states his conviction that an agency, more potent and far-reaching than mere erosion and disintegration by the ordinary processes of nature, has been at work. “From the point where Cougar creek first drops beneath Gopher bridge, the old surface channel may be traced, though dammed and nearly obliterated in places. If the natural dam shown at the first point of entrance were removed, the stream would again revert to the old entrance. Southwest of the old entrance is a still older natural dam, whose removal would allow the stream to proceed to the Mill bridge; thence, following the ravine between the two camp grounds, it would pass directly across the Gorge, supposing that great rift not yet to exist, and flowing past ‘Entrance No. 3,’ would descend in a cataract beyond Lookout point. “There is no doubt that these particular beds of limestone are badly shattered in the mass. It is shown by the fact that the surrounding streams, the Gopher falls, the periodical stream flowing to Entrance No. 3, and that of the Goat falls all join the main stream by underground ways. There are several other instances where the present bed of the creek could hardly be due to shrinkage and erosion, as in the case of the deep rift of the Gorge lying directly across the dip of the strata (the strata dip a little south of east, at an angle between 35 degrees and 40 degrees). The same thing is noticed in the subterranean bed 25 of the creek from the east end of the Witches Ball-room to where it crosses the main corridor near the Art Gallery. “From October 16 to 21, last, during the survey made of the Gorge series by the writer, though it was well below zero at the camp in the woods, there was no frost found in the cave interiors at a short distance from the entrance. Thus, two of the highest factors of disintegration, sun and frost, are lacking, when accounting for the wholesale cleavage that has taken place within the old waterways. The enormous size of the blocks, moreover, and the indication that the largest of them had been displaced a very long time ago would point to the agency of a severe shock or series of shocks such as would be caused by an earthquake or some similar seismic disturbance. That such disturbances have taken place and acted in this particular locality is borne out by other curious phenomena for which it is difficult to find a different explanation. 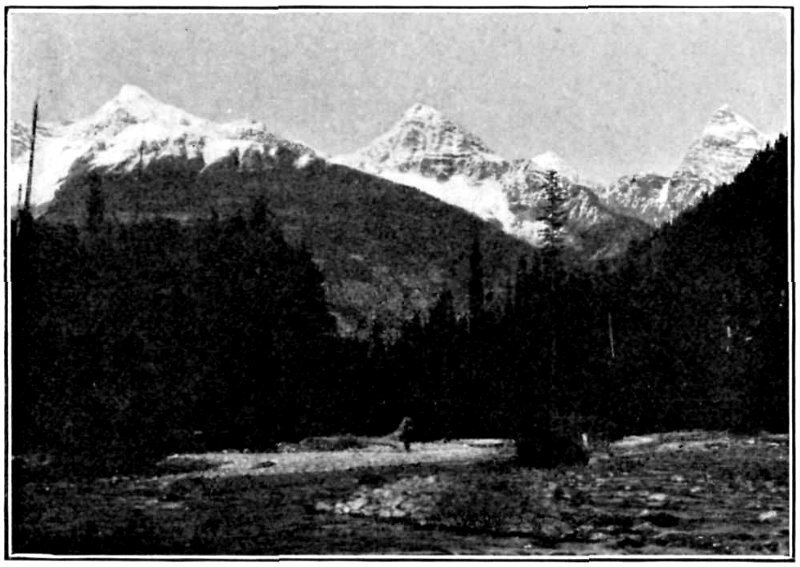 “In 1904, Prof. W. H. Sherzer, on behalf of the Smithsonian Institution of Washington, D.C., visited the Canadian Rockies for the purpose of studying their glaciers. 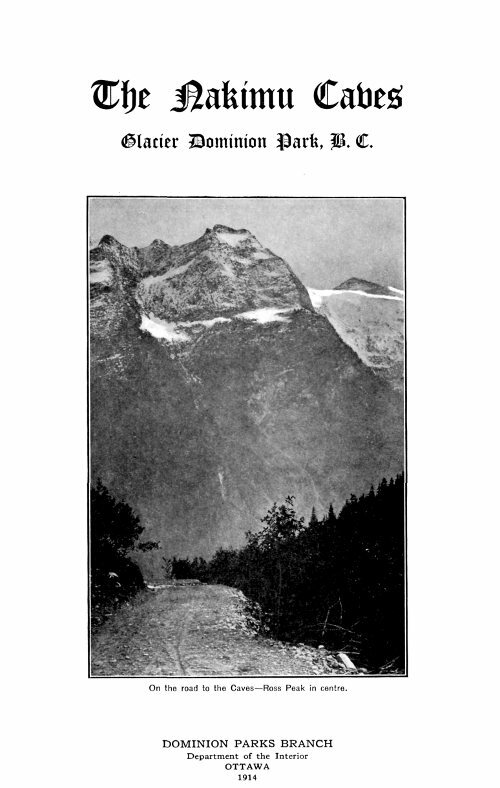 Among a series of five, he made a special study of the Illecillewaet glacier situated about seven and a half miles from the Caves. At some distance from the present ice-tongue of the glacier, were found two moraines about a third of a mile apart, composed of enormous blocks of quartzite, weighing in some single instances as much as 1,250 tons, and retaining the original shape in which they were cast from the peaks above to the snow-field and glacier transporting them to the place where they are now found. Prof. Sherzer has named these ‘Block Moraines’ in distinction to ordinary moraines composed of ice-worn, rounded boulders imbedded in a species of cement, commonly known as boulder clay. “The question is: How and at what time were these block moraines formed. At the present day the glaciers are wholly incapable of transporting such a load, and no such quantities of material are to be found upon the snow-field, below the peaks, as would be necessary to form a similar moraine, even during a protracted period of rest on the part of the glacier. “In the endeavor to ascertain a date for their formation, Prof. Sherzer cut down trees growing between the two moraines and counted the rings of growth. The oldest was found to have an age of 550 years. Trees, also, growing on the inner or younger moraine were measured and the age of the oldest ascertained to be 447 years. Allowing for the time required for the collection of sufficient soil to permit of growth taking place, the moraine, therefore, would be between 500 and 600 years old. Government building at the Caves for the use of visitors. “The marble rocks in which the cave is formed belong most probably to the Devonian age. No fossils were found, however, to positively verify this conclusion. The limestone rocks have not been completely changed into marble at all points as was observed under ‘Gopher Bridge’ and in ‘The Terror.’ Notwithstanding the fact that the rocks belong to a comparatively old series, yet the beginning of the cave undoubtedly dates from a very recent geological time. “Assuming the rate of erosion to be one thirty-second of an inch in a year, then to cut down one hundred feet of rock, which is about the average amount eroded in the main cave, would require 38,400 years. Any actual rate greater or less than this assumption would increase or diminish the age of the cave. In several places along Cougar creek in the bottom of the cave an excellent opportunity is afforded to determine actually the present annual rate of erosion. A micrometer measuring apparatus should be used and the area of cross-section of the rock eroded per year thus accurately computed. Also the ratio between the area of the cross-section of the average stream and the area of the rock eroded should be determined. And finally, the quantity of water passing the given section in one year, and its velocity, should be accurately measured. Nakimu Caves may be reached by travelling to Glacier, in Glacier Park, B.C., on the Canadian Pacific railway, and from that point either by walking or riding on a pony a distance of about seven miles along excellent road and trail. A pic-nic party at the Caves. 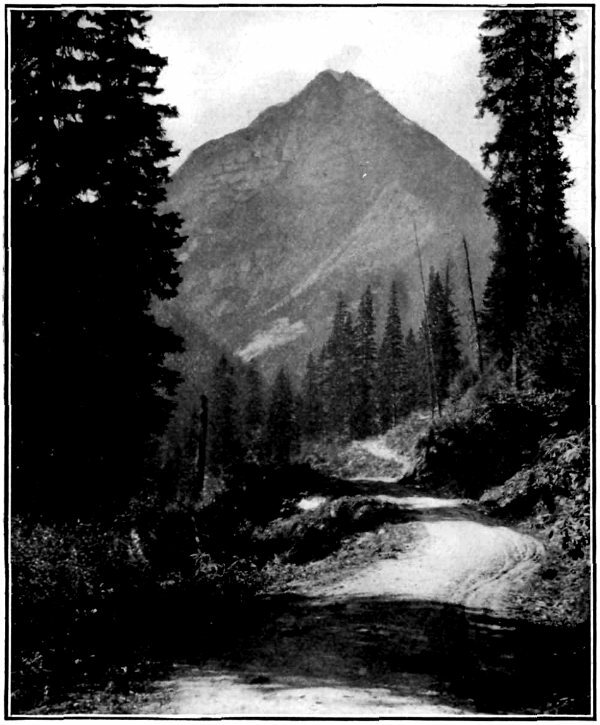 The distance to the Nakimu Caves from Glacier House by way of the wagon road—Illecillewaet river and Cougar creek, is 7 miles; by horse trail, via Rogers pass over the summit of Baloo pass to the Caves, the distance is 3 miles farther. Baloo pass is 6681 feet above sea-level, and from the summit is an extensive view, including not only the Hermit range and McDonald, but the Dawson peaks, Bishop range and the mountains that girt Cougar valley. At the Caves is a government building especially adapted for campers, with cook stoves and other conveniences. 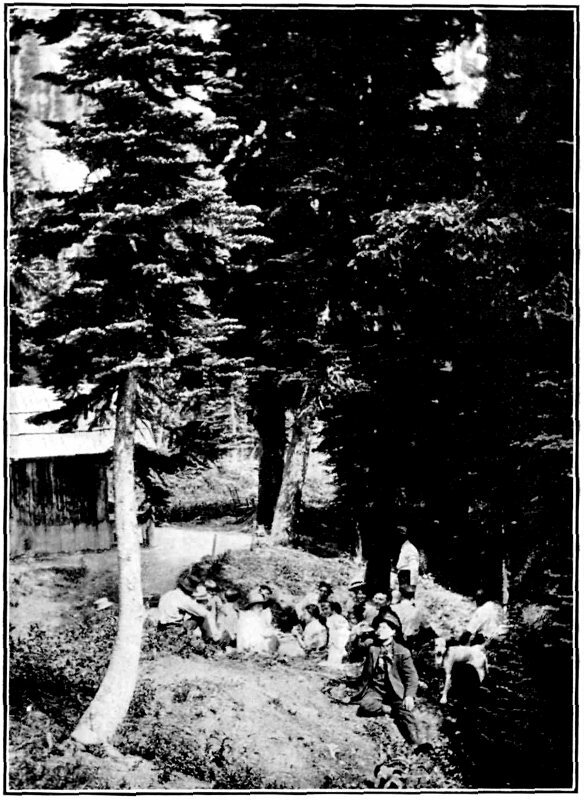 Parties desiring to camp can make arrangements by writing to C. H. Deutschman, The Caves, Glacier, B.C. This camp is the starting point for many easy and hard rock climbs. From Cheops, whose altitude is 8,506 feet above sea-level, but only 3,300 feet above the cabin, the view is unsurpassed, owing to its central location. The climb takes 3½ hours and, from the top, over 200 glaciers can be counted, and on a clear day the Rocky mountains, 150 miles away, can be seen guarding the horizon with rugged peaks. Cougar mountain (altitude, 7,882 feet, 2,500 feet above the camp) is an easier and shorter climb of 2 hours. Ursus Major, altitude, 8,930 feet; Ursus Minor, altitude, 9,026 feet; Catamount, altitude, 8,956 feet; Bagheera, altitude, 9,096 feet and many others, are within the limit of a day’s climb. The ice caves under the Glacier at the head of Cougar valley are also worth a visit. For botanists, this is a paradise, the alpine and sub-alpine flowers being gorgeous and abundant, and many rare species are found here. Over 150 species can be gathered in a short time in July or August. From Glacier House via Baloo pass to the Nakimu Caves, exploring Bear creek and Cougar valleys, spending the night at Camp, visiting “The Caves” and arriving at Glacier in time for dinner the following evening. in Cougar Creek Valley, Selkirk Mts.